While an adult's immune system can fight off many bacteria with ease, your baby's developing immune system may not be so adept. When you are pregnant, eating certain foods may be harmful for your baby's health. While certain foods, like alcohol, are on the definitive "no" list, other foods, such as bacon, can be a gray area. While you should always consult your physician on appropriate food intakes based on your overall health, bacon can be safe when eating under certain circumstances during pregnancy. One of the chief concerns surrounding eating bacon while pregnant is the increased risk for ingesting the bacteria Listeria monocytogenes, which can be found in uncooked bacon. These bacteria are naturally present in animals, plants, soil and ground water. Pregnant women are significantly more likely to experience listeriosis, the infection that stems from ingesting foods that contain Listeria monocytogenes. This infection can be very harmful because it is connected with increased risk for stillbirth, miscarriage and infection. Listeria monocytogenes can be killed via thorough cooking of bacon, according to Colorado State University Extension. If you do choose to consume bacon while pregnant, it's important that you cook it until it is crispy and red in color — carefully inspect the bacon for "cold spots" where the bacon may not have been cooked as thoroughly. If you are eating leftover bacon, it must be cooked to a temperature of at least 165 degrees Fahrenheit before you eat it. You also should practice safe food handling practices, such as separating uncooked bacon from vegetables, cooked and ready-to-eat foods and thoroughly wash your hands before and after handling bacon. The good news is that bacon contains a mineral called choline, which could help your baby's brain develop, according to "Mail Online." For this reason, thoroughly cooked bacon may be potentially helpful. If you have consumed bacon during pregnancy, be aware of symptoms that could indicate a listeriosis infection. These include flu-like symptoms, such as easy fatigue, stomach upset and a general feeling of being unwell. Because these symptoms closely mirror those associated with pregnancy, call your physician if you are unsure whether your symptoms are related to listeriosis. If you are diagnosed with listeriosis, antibiotics can typically cure the infection. 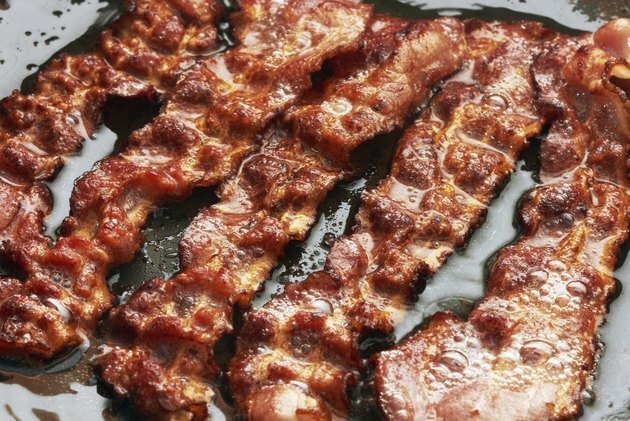 Another concern surrounding eating bacon is that it is cured with sodium nitrate, a substance that is linked with possible carcinogenic status, according to Sutter Health. It is possible to purchase bacon that has not been cured with sodium nitrate. Look for labels like "nitrate free" or "nitrite free" and continue to cook your bacon products thoroughly.